No, it’s not just you. The Dell Latitude 5285 hybrid is a dead ringer for the Microsoft Surface Pro 4. But while Microsoft targets consumers and businesses with its Surface Pro 4, Dell has honed its Latitude 5285 2-in-1 for the enterprise, forgoing features aimed at entertainment in favor of performance, security, and connectivity enhancements that may just have businesses sold on the hybrid “tabtop” concept. On the surface, the Latitude 5285 is an unabashed clone of Microsoft’s hybrid. That’s not a bad thing, given the Surface Pro 4’s solid design. And where it differs, with its brushed metal finish in carbon black and its sleeker contours, the Latitude 5285 looks and feels like an upgrade over the now-tired design of the Surface Pro 4. 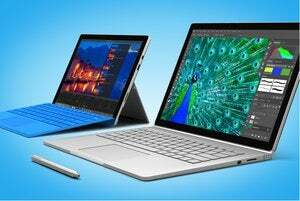 Microsoft's Surface Pro 4 and Surface Book set high standards for convertible laptops. The Latitude 5285’s biggest drawback is its display, offering a resolution of 1920x1080 pixels versus the Surface Pro 4’s 2736x1824. Considering it’s a business device, that may not be that big of a deal, given that for work purposes, resolution isn’t as high of a priority as it is for those streaming movies. The 1080p display is more than enough for the average user to be productive with email, document creation, and spreadsheet work. While I love the Latitude 5285’s tablet design, Dell lost me with its Travel Keyboard. I’ve used the Surface Pro 4 for almost two years, and the Microsoft Type Cover is crisp and responsive. The Dell Latitude 5285 Travel Keyboard feels like a cheap imitation at a higher price. Its keys are smaller and set farther apart, and the trackpad is laggy. It wouldn’t bother me as much if the keyboard shipped with the device -- but it’s sold separately for $130. You can currently get Microsoft’s Type Cover for as low as $94 on Amazon, and it offers a far more comfortable typing experience. Of course, if you rely on a traditional workstation and plan to use a wireless keyboard and mouse, Dell’s Travel Keyboard might not be as much of an issue. But if you travel or plan to use this hybrid away from your desk, the keyboard will take some getting used to. The Dell Latitude can be customized with 4GB, 8GB, or 16GB of RAM and up to 1TB of storage -- all on par with the Surface Pro 4. But while the Surface Pro 4 still runs Intel’s 6th generation Skylake processors, the Latitude includes a 7th generation Intel Core Processor -- you can chose an i3, i5, or i7 -- with an Intel HD Graphics 620 graphics card, making it a more enticing option for IT departments looking for improved performance. The device I tested had an i7 Intel Core Processor and 16GB of RAM, more than enough performance for the average corporate user. I found that Dell bloatware slowed down the machine a bit, but after updating the BIOS and uninstalling bloatware, it ran just fine. At those specs, it’s hard to be disappointed, and IT departments will likely be able to deploy a lower-spec model for most end-users. While performance was solid, the device did heat up surprisingly fast -- as in 20 minutes out-of-the-box fast. I had barely set up my Microsoft account, downloaded a few basic apps, and installed Chrome before the top and bottom of the display became hot to the touch. It’s concerning for long-term performance, and it’s something to think about if you plan to use the device on your lap. But for a business user parking the Latitude 5285 on a desk, it’s not a deal breaker. The Dell Latitude 5285 will fit right into an enterprise setting -- especially one that already relies on Dell hardware. Although Microsoft makes it easy to purchase the Surface Pro 4 through Dell, deploying an entire fleet of Dell devices can streamline maintenance, support, and budgeting for IT departments. Dell also offers more appealing customizations for business users -- such as the option to include a higher-capacity battery with ExpressCharge and LTE capabilities -- two things the Surface Pro 4 doesn’t offer. Businesses can also upgrade to an infrared camera that will support facial recognition with Windows Hello. There’s also the option to include a FIPS 201 smartcard reader or fingerprint scanner for added security, as well as an NFC (near field communication) reader. The Latitude 5285 can also be equipped with Intel vPro technology for remote management, a small feature that can save IT departments a lot of time. In addition to a load of security features, the Dell Latitude 5285 also includes two USB Type-C ports, a USB 3.0 port, and a locking port, which means it’s more than ready for your workstation. Dell may have heavily borrowed from Microsoft’s design, but the company has taken steps to set it apart as a business-focused device. Make no mistakes, the Dell Latitude 5285 is a business device, not a consumer device -- but it offers a modern, refreshing design that you won’t find on most business laptops. It priced similarly to the Surface Pro 4 -- starting at $899 for the entry-level model with an i3 processor, and going up to nearly $2,000 for the highest configuration; but don’t forget to tack on an extra $130 for the keyboard cover.